I have a confession to make. I love Hamburger Helper. Like, I LOVE it. Mostly because the onions like it but also because it’s something Husband can make on his own one of the three nights each week I’m out until after 7PM shuttling onions to and from practice. And because I'm not completely oblivious, I know it’s chocked full of sodium and preservatives and powdered, processed crap. 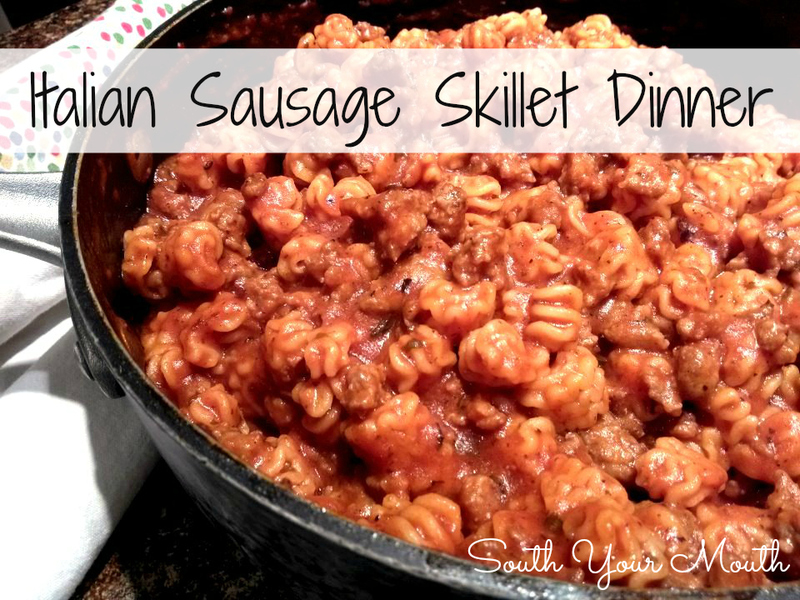 I've been thinking about making an alternative one-pot dinner and this weekend I finally got around to it! Just so you know… Husband said this was a “keeper” and to put it in the weekly line-up. That's like saying something is phenomenally, mind-blowingly amazeballs in Husband-speak. You can healthify this thing up a bunch too… use turkey sausage and add fresh veggies if you’d like! Brown sausage in a 12-inch skillet (remove casings if applicable) over medium-high heat until cooked through. Add garlic and continue cooking for 2 minutes. Add spaghetti sauce, water, Italian seasoning, salt and pepper and stir to combine. Add pasta and cook until sauce starts to boil. Reduce heat to medium-low, cover skillet and continue cooking for 12 minutes; stirring occasionally. Remove skillet from heat, stir in parmesan cheese and let stand, uncovered for 5-10 minutes or until sauce has thickened. Stir once more before serving. *such as Prego Chunky Garden. If you don’t use a chunky sauce, you may need to reduce the water by 3-4 tablespoons. Gosh, I used to live on Hamburger Helper in college...haven't had it in a long, long time! Made this last night and it was delicious! I couldn't find "pasta ruffles" so I used Campanelle and it worked out fine! I also had 3 fresh mushrooms that were not so fresh anymore and so I chopped them up and threw them in there. Thanks for this recipe! Glad you liked it! Love that you snuck those fresh veggies in there too! I make this but use spicy Italian sausage. I add chili flakes and along with sautéed fresh onion, garlic, I add sizeable strips of red bell pepper. It is spicy, just the way we like it. And I always use the Radiatore shape pasta nuggets. Funny I ran across this recipe today, because it was already on my menu for tonight....Yum!